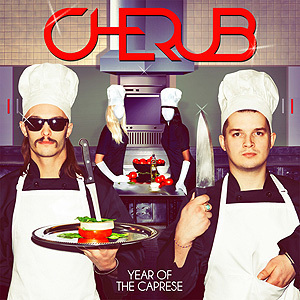 “Year of the Caprese” is the first big release by the Tennessee band formed in 2010, Cherub. I couldn’t say “it sounds like nothing I’ve heard before” but in the case of Cherub that’s really not a bad a thing. Familiar scapes is what keeps the sounds of the album engaging. The band features an electro-pop style with their more relaxing tracks even containing a scent of R&B. “Year of the Caprese” is full of satisfying tracks that won’t blow away any high expectations but if you want to listen to something catchy and stylish, the album can definetely surpass your expectations. If we were to actually grade it song by song for what the album’s content really is, overall it would definitely have a high score. Of course, the band’s most popular track “Doses & Mimosas” is present yet again, after originally being released in early 2012 and finally picking up some mainstream attention in February 2014. It is right there, in the middle of the track list, as a hidden treassure for first time listeners. Finally, I can’t really call this a varied album but it will still satisfy a range of people, traditional pop fans, electronica fans and maybe also a few R&B listeners.